Industrial Indexing Systems recently designed and built an advanced servo controlled registered embossing system for the beverage industry. This automated system embosses a body at production speeds up to 1,500 cans per minute. 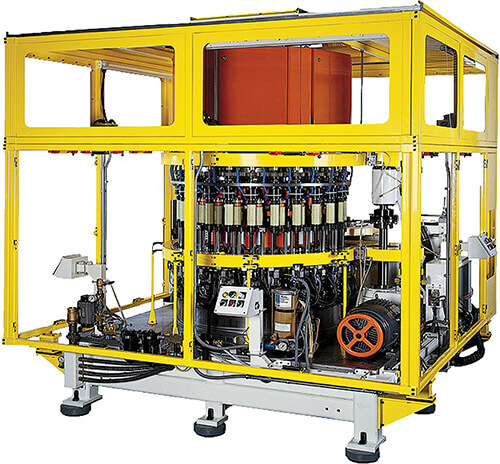 This IIS system design incorporated 24 servo controllers that were housed within a hexagonal enclosure and placed atop the machine. Also supplied and installed on the actual machine are a touch screen, 24 servo motors, 24 fiber optic sensors, a video-jet printer/encoder, as well as a slip ring assembly. In addition, six separate enclosures were also built to house four station resolvers that acted as the master for each axis. All servo controllers were designed to communicate thorough a CAN-bus network with the entire motion system interfacing to the overall machine computer, a PLC. The servo controllers, products of IIS, are part of the DELTAMAX series and provide full motion control flexibility. This flexibility allows the system to register the embossing to the printed material on the can for a perfect alignment. In addition, IIS designed an embedded processor system (RPV-100) that can turn on individual output signals based on the position of the main turret to provide real-time limit switch processing capabilities. This processor system also transmits the precise hour and second information of when each can was produced to a high-speed video-jet printer. Within 847 milliseconds, this impressive, servo controlled can embossing system can feed a can into the system, register label decoration to a known position, emboss the can, and then release a finished product. IIS handled all enclosure fabrication and rigorous testing of this system in-house, ensuring that this new can embossing servo system fully met required CE compliancy. We now install these can embossing units throughout the globe, including in the US, Mexico, Canada, Australia, Norway, Poland, and Germany. 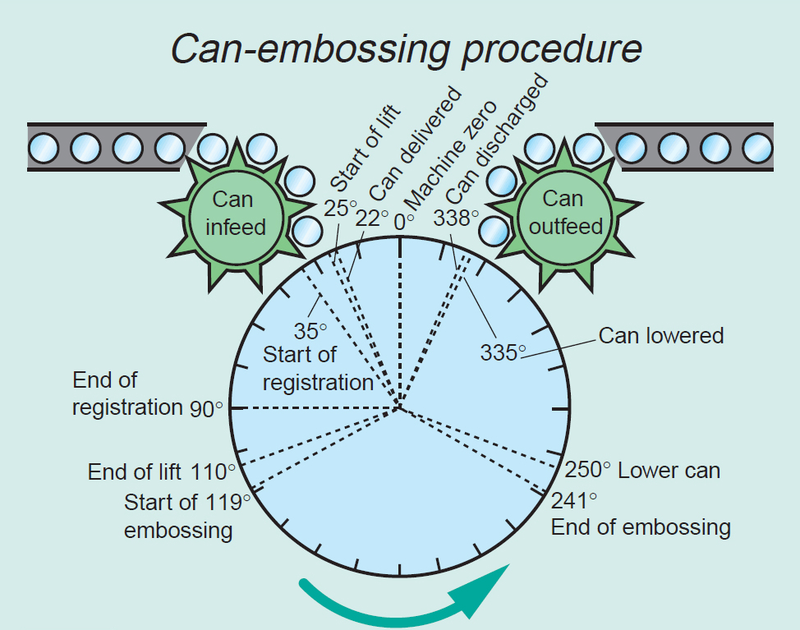 This registered can embossing system produces 1500 cans per minute at a cycle time of 847 milliseconds per can.